I had to go see my doctor last week and was lucky enough to bring along my stepdaughter, Alexis (11) and my toddler, Fiona (18 months). Fiona was running around, unplugging things, trying to climb onto the bed thing (using multiple unstable drawer-steps), and Alexis was just being an 11 year old (asking a ton of questions, being a goofball, etc.). I snapped at Alexis that I needed her help and for her to quit messing around. I felt really bad about it later because I realized that I was treating her like I’d treat a 16-year old…. just because I have a tyrant for a toddler. How do you juggle a much older child with such a young one? I need help with the toddler sometimes but I also don’t want to put too much pressure on Alexis. I try and make sure to carve out “us” time for Alexis and me (we’ll watch a movie together that Fiona wouldn’t be interested in or something like that) but, when we’re in public, I want to make sure I’m treating her like a normal 11 year old… just because Fiona is running around doesn’t mean Alexis has to act 5 years older than she is, right? Fiona was having a tantrum earlier this morning and Alexis said, “Fiona, it isn’t all about you.” Also, last night when my husband tucked Alexis in, he said, “So Stevie has to work tomorrow so it’s just you, me and Fiona tomorrow.” Alexis replied, “Yeah, until Fiona takes all the attention.” Well that totally broke our hearts! How do you balance: a) treating your self-proclaimed “pre-teen” as a young lady while simultaneously allowing her to be a kid and b) make sure you’re giving enough attention to both kids? Fiona goes to bed between 8 and 8:30 and Alexis goes between 9 and 9:30 so we try to spend that extra hour with Alexis doing something special (playing Harry Potter Uno, watching a movie, etc.) but it still isn’t enough. What should I do to make it so both girls feel special? How on earth am I going to make both girls feel special when the baby boy comes in the fall? These are serious questions, people! HELP!! 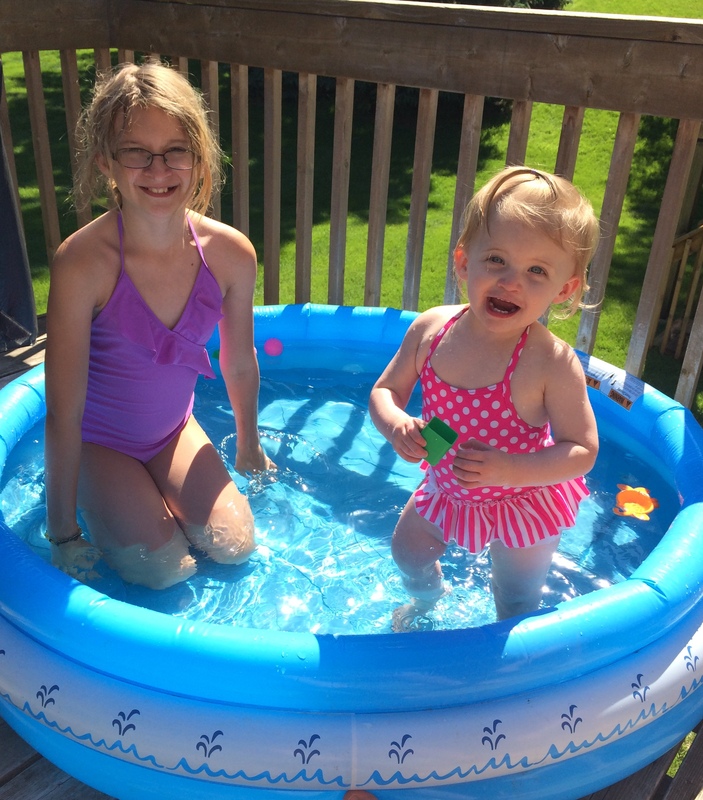 Below is a picture of the girls playing in the pool today…. Yes, Alexis believes she’s too old for the kiddie pool but she still had fun! Next Post Well That’s Why You Have a Black Eye…..
Let me know if you figure this one out! My 10 year old stepdaughter just informed my husband and I that we can’t have another kid because she likes being the only child here (she isn’t at her mom’s house). It broke my heart. Obviously we won’t let her make that decision for us – but it made me realize that it will be a constant tightrope walk! Best of luck!